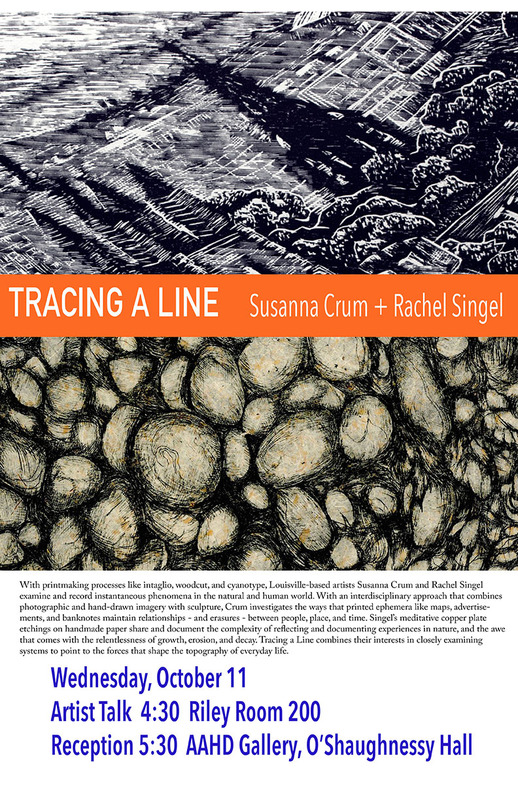 Exhibition Opening and Artist Talk: "Tracing a Line"
The Department of Art, Art History, & Design will exhibit work from Susanna Crum and Rachel Singel entitled, “Tracing a Line,” from October 5 to October 28, 2017 in the AAHD Gallery of O’Shaughnessy Hall. A public artist talk by Crum and Singel will be held on Wednesday, October 11 at 4:30 PM in 200 Riley Hall of Art with a reception to follow at 5:30 PM in the AAHD Gallery. With printmaking processes like intaglio, woodcut, and cyanotype, Louisville-based artists Susanna Crum and Rachel Singel examine and record instantaneous phenomena in the natural and human world. Within an interdisciplinary approach that combines photographic and hand-drawn imagery with sculpture, Crum investigates the ways that printed ephemera like maps, advertisements, and banknotes maintain relationships – and erasures – between people, place, and time. Singel’s meditative copper plate etchings on handmade paper share and document the complexity of reflecting and documenting experiences in nature, and the awe that comes with the relentlessness of growth, erosion, and decay. Tracing a Line combines their interests in closely examining systems to point to the forces that shape the topography of everyday life.